Sableye in game: 10,470 Who? Important notice! Pokemon Sableye is a fictional character of humans. 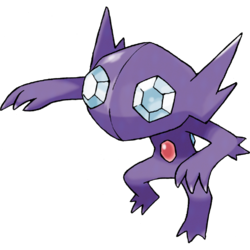 While is not known to evolve into or from any other Pokémon, it can Mega Evolve into Mega Sableye using the Sablenite‎. Sableye is a bipedal Pokémon with a dark purple body, armed with sharp teeth and claws. It has pale blue, gemstone-like eyes, which allow it to see in low light and sparkle in the dark. It also has a red gemstone on its chest, and its back has a blue and green gemstone as well as another red one. These gem-like eyes and adornments on its body are caused by its diet, which consists of rocks and raw gemstones. It also targets Carbink as prey, though they are usually taken by Gabite before Sableye can reach them. It is feared by people, since it is said to steal a person's soul if they look into its eyes. It is nocturnal and is rarely seen. It lives in caves. As Mega Sableye, all the energy from its Mega Evolution is concentrated into the red jewel on its chest, causing it to detach from Sableye's body and significantly increase in size; the detached jewel leaves a small hole in Mega Sableye's chest. Its ears elongate, and it gains a spike on the top of its head. Its teeth turn from white to yellow, and its eyes also change from pale blue to a crimson red, with diagonal slits at their inner edges. 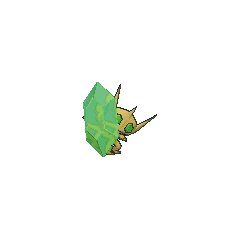 The enlarged jewel is said to boast such incredible hardness that no attack can even leave a scratch on it. 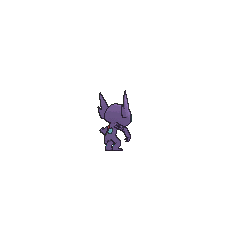 During battle, Mega Sableye shelters itself behind the jewel, from where it can take advantage of any openings its target leaves exposed. However, being forced to support its massive jewel leaves Sableye unable to turn quickly, making it vulnerable from behind. Cassidy's Sableye debuted in Oaknapped!. Sableye first appeared in the anime in Ready, Willing, and Sableye. The Darkness Pokémon was playing tricks on Ash and his friends. A Sableye appeared in PK15. Multiple Sableye appeared in Pokémon Mystery Dungeon: Explorers of Sky - Beyond Time & Darkness where they tried to stop Team Poképals. A Sableye appeared in Genesect and the Legend Awakened. 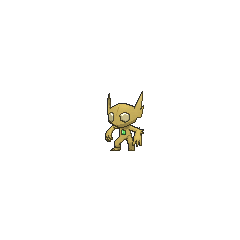 A Sableye appeared in Cloudy Fate, Bright Future!, under the ownership of Carrie. A Sableye appeared in the opening of Destiny Deoxys. A Coordinator's Sableye appeared in Lessons in Lilycove participating in the Lilycove City Pokémon Contest. A Sableye also made a cameo appearance in What I Did for Love!. A Trainer's Sableye appeared in Summer of Discovery!, Foggy Pokémon Orienteering! and Battling Into the Hall of Fame!. A Sableye that can Mega Evolve into Mega Sableye appeared in Mega Evolution Special II. Four Sableye appeared in the Hoopa's Surprise Ring Adventures short In the Dark. Six Sableye belonging to six different Trainers' appeared in Alola to New Adventure!, with one of them appearing in a flashback. A Trainer's Sableye appeared in The Guardian's Challenge!. A Sableye appeared in SM004, during a fantasy. A Trainer's Sableye appeared in SM006. A Trainer's Sableye appeared in SM007. Sableye first appeared at the end of the Gold, Silver & Crystal chapter as a wild Pokémon pictured in one of the many photographs of unseen Pokémon that Professor Oak discovered. In the Ruby & Sapphire chapter, it appeared once as a wild Pokémon in the Sky Pillar. In the Emerald chapter, Sableye appeared under Trainer ownership for the first time. One was a Battle Factory rental Pokémon that Emerald faced. Another Sableye was owned by Hex Maniac Valerie who took part in the preview Battle Dome tournament. 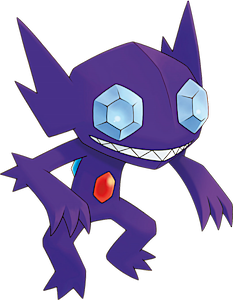 A Sableye appears as one of the Pokémon owned by the Team Galactic commander Jupiter. She used it alongside her Gastrodon and Tangrowth to attack Platinum, Candice, and Maylene when they arrived in Lake Acuity. Draconid Renza owns a Sableye which appeared in the Omega Ruby & Alpha Sapphire chapter. Sableye is Brawly's only known Pokémon. 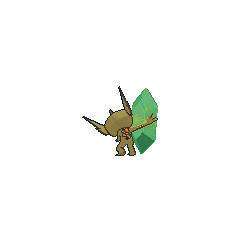 It is considered an unusual choice for him as it was not a Fighting-type and it is immune to Fightingmoves. Erases Pokémon (max 3) of the same type as Mega Sableye. Mandarin Chinese 勾魂眼 Gōuhúnyǎn May mean "Soul-evoking eye"